Dedicated Lottery games such as scratchcards should be introduced to support the Glasgow Commonwealth Games, the Scottish sports minister has said. Shona Robison also stepped up the SNP's fight to retrieve £150 million in lottery funds, which it claims could be diverted from Scottish projects. The minister has asked to meet UK Sport Secretary Andy Burnham to discuss any Lottery cuts to fund the 2012 Olympics. She also hopes a 2014 Commonwealth scratchcard can be adopted in the UK. 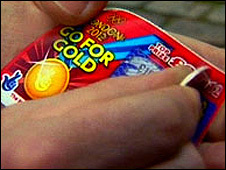 Specialist Lottery games have already raised about £375m for the 2012 event. Ms Robison said: "I want the Commonwealth Games to deliver life changing opportunities for communities across the whole of Scotland for generations to come. "This is why the return of £150m lost lottery funding to Scotland is so important. "This issue cuts across the political divide and has unanimous support from the Scottish Parliament." She said lottery games had secured "serious sums" of funding for the London Olympics. "I want to ensure Scotland gets its fair share," she added. "Specialist games such as scratchcards are one way of raising money without taking cash from the public purse. "However, I am willing to look at all funding mechanisms to enrich our communities and give the people of Scotland a 2014 legacy of which we can all be proud."